I am in the unique position that I get to talk to many customers nationally every day, and the consistent message I hear is that weekly rental rates continue to fall and there is no sign they will increase any time soon. There is no easy solution to this problem, and the dream of “rental rates skyrocketing” may only seem like a pipe dream now, but I am also a firm believer that our current condition does not have to be our future, and there are actions we can take to improve rental rates in the access industry. One action I have spoken about before is setting up an independent body to collect rental data like rental rates, physical utilization, dollar utilisation and fleet age. The U.S. have done this very well and now have over 52 equipment rental companies across the U.S. reporting to Rouse Analytics on a weekly basis. Participating rental companies receive a summary level comparison of their rental rates and other key performance metrics to local market benchmarks every month. Ultimately, each rental company can set whatever rate they want, but I would have thought having this information would help with these strategic decisions. This year’s show on the Gold Coast was a great success, and I would like to thank all customers for attending our customer appreciation night and launch of Genie 360 Support. 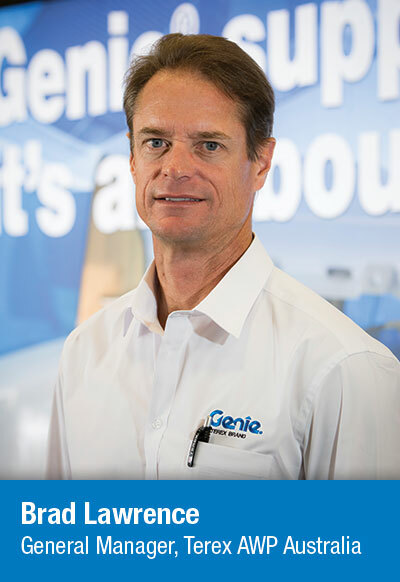 Our goal at Genie Australia to provide solutions for our customers throughout the whole product life cycle, and Genie 360 Support is going to be the platform for delivering those solutions. At our stand, we showed off the five pillars of Genie 360 support which are Technical Support & Training via Genie Tech Pro Training, Service & Maintenance Excellence, Genie Genuine Parts, Fleet Management Solutions, including used equipment and rebuilds, and Operator Machine Specific Training via Genie Lift Pro. The five pillars are designed specifically to provide value to our customers, and over time, we believe will be the key reason why people buy blue.